SEASIDE, Ca., Oct. 19, 2017 – CSUMB and Hartnell College will host aspiring behavioral health professionals at a day-long symposium at CSUMB’s University Center on Saturday, October 21, 2017. The symposium, hosted by CSUMB’s Master of Social Work program, is titled Ensuring Community Wellness: A Behavioral Health Care Career Symposium and Resource Fair and will promote integrated primary and behavioral health career professions. Dean Britt Rios-Ellis speaks to CSUMB Master of Social Work students about facilitating meaningful dialogue. 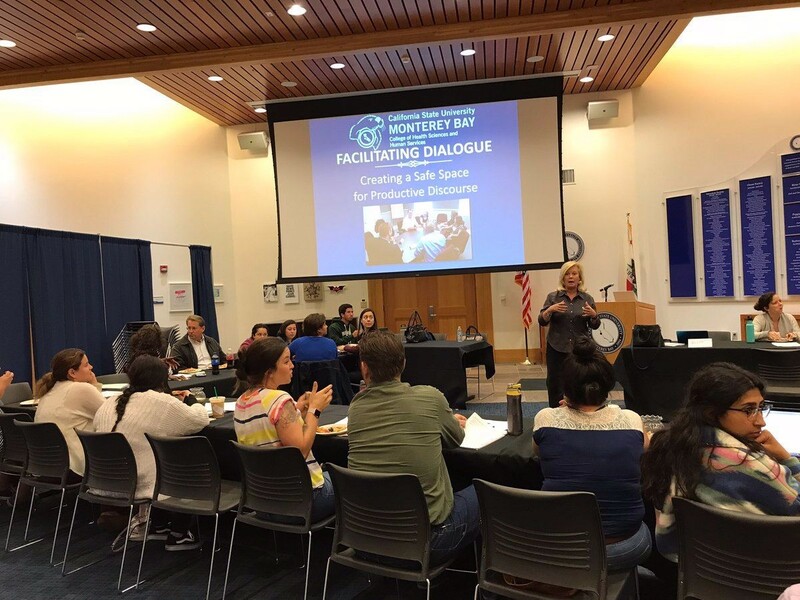 The goal of the symposium is to increase the number of students from the Central California community who are already in higher education and are interested in a health professional career. "This is our third year collaborating with Hartnell to grow the behavioral health care workforce in our woefully underserved community. Our master of social work students look forward to this every year, mentoring community college students to consider the social work profession - one of the most wonderful and meaningful careers you could imagine," said Julie Cooper Altman, project director and CSUMB professor of social work. Topics will include consumer empowerment, community identified best practices, the social determinants of health, especially minority stressors and the impact on mental health, resilience and suicide prevention. Efforts are aimed at increasing participants’ comfort in accessing mental/behavioral health services as well as pursuing careers in integrated primary/behavioral health care. This project is funded through a grant from the State of California Office of Statewide Health Planning and Development (OSHPD) Healthcare Workforce Development Division. The program is designed to engage students from rural, economically disadvantaged or medically underserved areas in the consideration of opportunities in integrated primary and behavioral health care professional training, while increasing their capacity to successfully enter training.